Inside the museum, visitors embark on a narrative journey, following exhibitions that focus on the people – the soldier, sailor, airman, Marine, Coastguardsman, and their families – from answering the call to life after military service. Individual stories and shared experiences are illustrated through personal artifacts, quotes, letters, imagery and powerful films of veterans telling their unique story in their own words. The moment visitors walk through the front door, they are introduced to veterans from across the country, creating a powerful visual reminder that veterans are among us every day and have long played a significant role in serving and protecting the nation. The Great Hall is an open, inviting space with large-scale installations that set the stage for the museum journey and situate the museum in national contexts. There are multiple sections of the Permanent Exhibit Experience. Moving through the exhibition program, 14 Thematic Alcoves highlight key themes and moments in veterans’ journeys and incorporates personal stories, past and present, to share a wide range of challenges, sacrifices, and achievements. A linear Timeline serves as the chronological backbone of the museum journey with personal stories of those who have served over time highlighted through artifacts and images. The Legacy of Service exhibit provides inspirational stories of ways veterans are using the values and skills of learned in military service by helping their communities. This exhibit also illustrates the ways we honor and support veterans, provides resources and encourages visitors to join a national conversation to begin to bridge the gap between civilians and veterans. 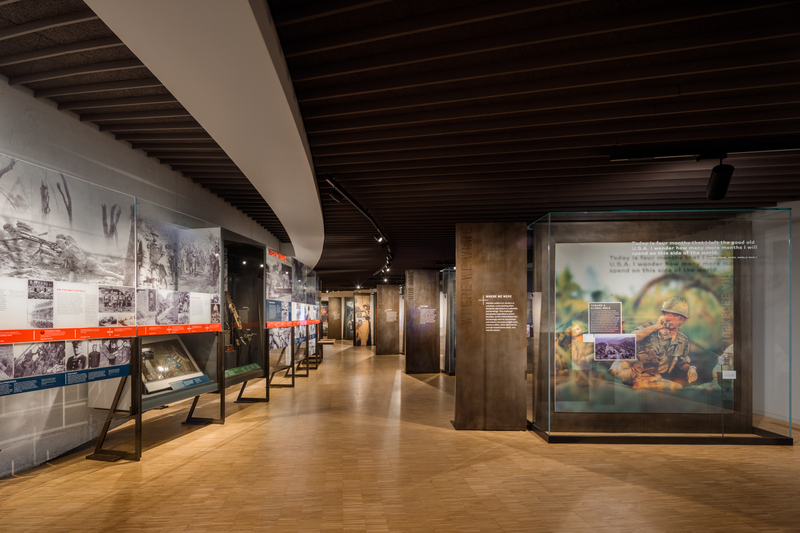 The Service and Citizenship Gallery serves as the emotional core of the experience, bringing together themes explored throughout the journey and looking at the higher ideal of service. Lastly, the visitor ascends to the Remembrance Gallery on the mezzanine level, which is a space for reflection and recollection of those who made the ultimate sacrifice, with a warm colorful glow coming through the floor-to-ceiling stained glass installation inspired by military campaign ribbons. The focal point is an "infinity-flag" display, honoring the millions of who died in the name of service to the country. These exhibitions connect historical events to current concerns and transformative military service to the broader idea of community service. The aim: to stimulate an ongoing dialogue to strengthen understanding and respect between civilians and veterans. Visitors can also leave their own story behind; the Share Your Story space features a story booth where visitors can answer a series of prompts and questions to create a short video of their own piece of history. The inaugural temporary exhibition is Light During Wartime, the combat photography of Stacy Pearsall. The American photographic record of war dates back to the Civil War and the searing images Mathew Brady took in the aftermath of the battle. These photographs and those from subsequent wars brought Americans and the world a crucial record of events and a profoundly human dimension to the experience of combat. It was not until World War II that combat photography units became formalized in the military. Stacy Pearsall is part of this lineage of service members who have trained, served, and in their role as combat photographers, have shed light on what life during war is really like. Of her ten-year career, Pearsall served six years in the Air Force 1st Combat Camera Squadron. Her first combat deployment was to Iraq in 2003, followed by a series of assignments that included the Horn of Africa, the Middle East, the Arabian Peninsula, and return trips to Iraq. She retired from service in 2008 after being wounded in combat. This selection of photographs showcases Pearsall’s painterly use of light and shadow as she follows U.S. military troops on missions and portrays moments of action as well as another aspect of the combat experience—the in-between moments of camaraderie, rest, and reflection. Directly adjacent to the Museums lies a 2.5-acre Memorial Grove, designed for contemplation and reflection before visitors return to their everyday lives. Anchored by a grove of Elm trees, the space already has a 325-foot stone wall, featuring three cascades of water and a reflecting pool lining the basin, creating a cohesive space for remembrance, inspiration, and the recognition of service. Visit our gallery to view the most recent images of the National Veterans Memorial and Museum.